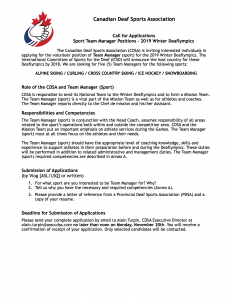 We are looking for five (5) Team Managers for the five (5) sports represented at the 2019 Winter Deaflympics. All interested individuals must send their candidature no later than November 20th at noon. Click on the image for the complete job description.